One more important day for CTG which I had opportunity to proudly attend. Four Cities (Schenectady, Troy, Amsterdam and Gloversville) kick off effort to combat urban blight with NY Department of State Local Government Efficiency Grant. This is another great project led by CTG, which during its 20 years has shown competence and results in the use of ICT in Government. It is not for nothing that the CTG is widely highlighted in eGovernment. It is really an honor to be part of this family and be able to applaud their competence, courage and hard work. 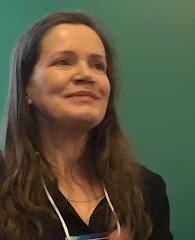 This event was very prestigious, as it can be seen below in the copied news from UAlbany's website and this few links with coverage from the press conference: CBS6, WNYT, The City of Schenectady’s YouTube, Daily Gazette, Times Union, CTG Website. Taking part in the May 7 announcement of a new 4-cities program to combat urban blight are, left to right, Mayor Dayton King of Gloversville, Mayor Lou Rosamilia Troy, President Robert Jones, New York Secretary of State Cesar Perales, Center for Technology in Government Director Theresa Pardo, Mayor Gary McCarthy of Schenectady, Mayor Ann Thane of Amsterdam, Peter Baynes of the New York State Conference of Mayors, Mark Pattison, Department of State director of local government services, and Carl Ublacker, Department of State land use training specialist. 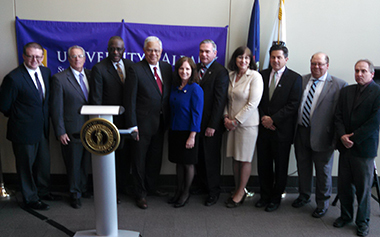 Albany, N.Y. (May 7, 2015) — The cities of Schenectady, Troy, Amsterdam and Gloversville and the University of Albany’s Center for Technology in Government (CTG) today kicked off a pilot program to allow critical information sharing of code enforcement-related data so that communities can take proactive steps to combat urban blight. The pilot program is funded by a $558,000 grant from the New York Department of State. Throughout New York State, local leaders are working together to address the increasingly persistent and costly problem of urban blight. Sharing information among cities has been recognized as a powerful tool in combating urban blight and in reducing the impact of distressed and vacant problems on critical public serivces such as public safety and on economic development efforts. On average, a single depressed property can cost a municipality tens of thousands per year in direct and indirect costs. Direct costs include code enforcement, administration, engineering and property maintenance. Indirect costs include uncollected taxes on distressed properties, devaluation of adjacent properties and impact on city services such as police and fire calls. This project will develop a shared code enforcement information resource providing unprecedented consistency in code enforcement, improved government efficiencies, new opportunities for inter-governmental cooperation, and more informed public and private decision-making. This pilot project allows for critical information sharing of code enforcement related data so that communities can make more informed decisions and take proactive steps to combat blight. This pilot project provides the foundation for a long-term, State-wide strategy to share data and develop best practices in combating urban blight. In the process, each of these participating communities will be working toward streamlining their respective code enforcement operations. This regional effort exemplifies the Capital and Mohawk Valley Region’s dedication to working collaboratively to develop a deep understanding of regional trends, chllanges, and workable solutions. CTG, an applied research center at the University at Albany/SUNY, is a world leader in working with governments to create new knowledge about public sector information and technology innovation and translating new knowledge into practice.